Former Panthers teammate Reagan Campbell-Gillard said he had spoken to Merrin, who insisted all the chatter was mere speculation. However, the Penrith prop revealed Merrin was reluctant to leave the NRL and only took up the offer because of the security of the long-term deal. “Obviously he was trying to get another club here to pick him up but that offer from Leeds was obviously something he couldn’t turn down,” Campbell-Gillard said. “It’s a different lifestyle. He probably didn’t want to do it on those types of terms but rugby league, it’s a bloody competition and it’s a business. 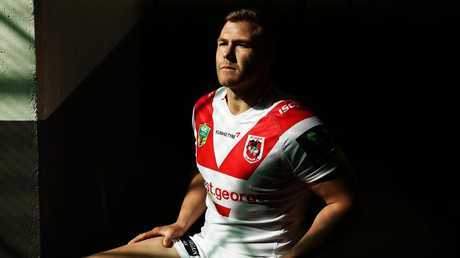 Campbell-Gillard said he had already circled in their date with the Dragons in the hope of going toe-to-toe with his former neighbour. “I’ve told him if he does come back I’ll be going for his head,” he said. “Round 18, I think. I’ve got some close friends at the Dragons as well. I know that exactly. Friday night, 7:30pm, out here.